Make music come alive with this creative collection of visuals and strategies. 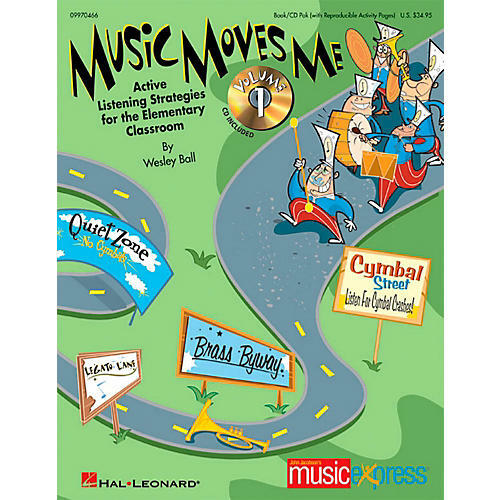 Created for the music classroom, this handy book/CD pak features reproducible listening maps and movement activities designed for a variety of levels, along with easy-to-use teaching plans based on the National Standards. All musical examples used are included on the CD. Featured listening selections include: Stars and Stripes Forever, Fanfare for the Common Man, Ev'rybody Wants to Be a Cat (from The Aristocats), Chinese Dance (from The Nutcracker Suite), Ballet of the Unhatched Chicks (from Pictures at an Exhibition), Histoire du Tango, Spring (from The Four Seasons), Variations on America, Variations on Simple Gifts, Stompin' at the Savoy, Russian Dance (from The Nutcracker Suite), Mars the Bringer of War (from The Planets), Splish Splash, Summer (from The Four Seasons).